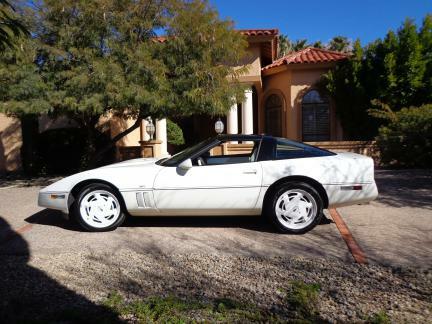 Description: CORVETTE RETURNED IN 1988 WITH A HOST OF IMPROVEMENTS THAT INCLUDED CARPETED DOOR SILLS, IMPROVED FLOW THROUGH VENTILATION AND A RELOCATED PARKING BRAKE HANDLE. LESS VISIBLE BUT MORE IMPORTANT WERE NEW DUAL PISTON FRONT BRAKES AND A REDESIGNED FRONT SUSPENSION THAT REDUCED STEERING KICKBACK FROM BRAKE TORQUE AND ROAD INPUT. 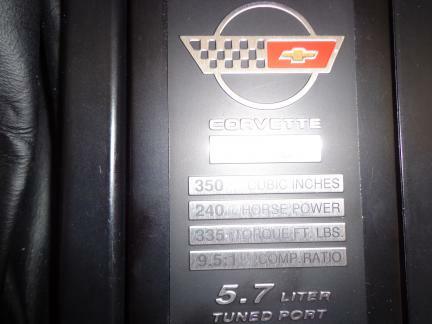 A MERE 2,050 CORVETTES BUILT IN 1988 WERE TREATED TO THE SPECIAL Z01 35TH ANNIVERSARY EDITION PACKAGE. 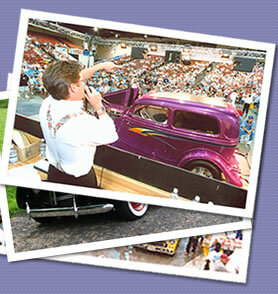 AVAILABE ONLY IN COUPE FORM, THIS $4,795 OPTION WAS DISTINGUISHED BY A TWO-TONE EXTERIOR COLOR TREATMENT OF WHITE PAINT WITH A BLACK ROOF BOW. 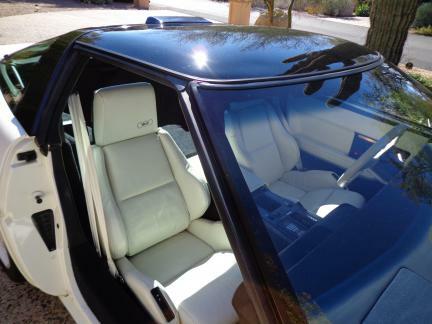 IN ADDITION TO MATCHNG WHITE LEATHER ON THE SEATS AND STEERING WHEEL RIMS, THE CAR ALSO INCORPORATED SPECIAL INTERIOR AND EXTERIOR ACCENTS, A CONSOLE-MOUNTED 35TH ANNIVERSARY PLAQUE, SPECIAL EMBLEMS AND OTHER DISTINGUISHING FEATURES, SUCH AS BLUE LIFT-OFF GLASS ROOF PANEL. MORE THAN JUST A COSMETIC TRATMENT, THE Z01 PACKAGE ALSO INCLUDED SPORT SEATS WITH POWER DRIVER’S SEAT. 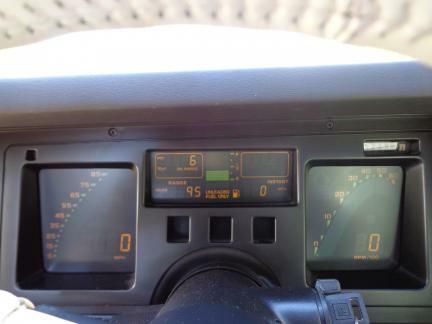 ELECTRONIC AIR CONDITIONING CONTROL, AN ILLUMINATED DRIVER’S VANITY MIRROR, REAR WINDOW AND DRIVER’S SIDE MIRROW DEFOG. 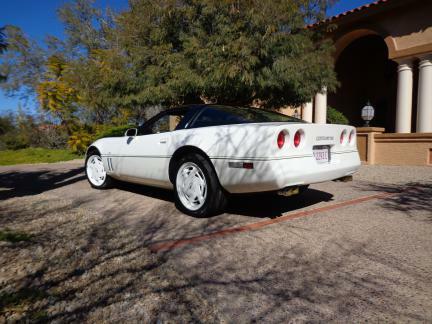 THE 35TH ANNIVERSARY WAS THE BEST HANDLING CORVETTE AVAILABLE THANKS TO THE A52 SPORTS HANDLING PACKAGE, WHICH FEATURED THE LARGEST WHEELS EVER SEEN ON A PRODUCTION CORVETTE – NEWLY STYLED 17X9.5-INCH ALUMINUM WHEELS WITH 12 COOLING SLOTS, MOUNTED P275/40ZR17 PERFORMANCE RADIAL TIRES. 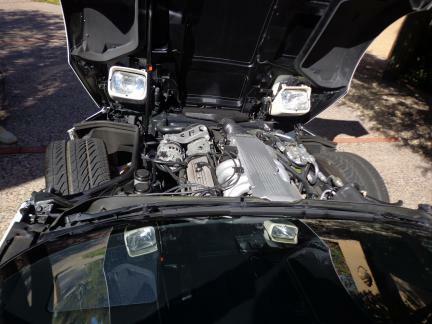 THE Z52 PACKAGE ALSO INCORPORATED HIGHER SPRING RATES, SPECIAL DELCO-BILSTEIN SHOCK ABSORBERS, A FINNED EXTERNAL POWER STEERING COOLER AND LARGER FRONT BRAKE CALIPERS AND ROTORS FOR INCREASED STOPPING POWER. 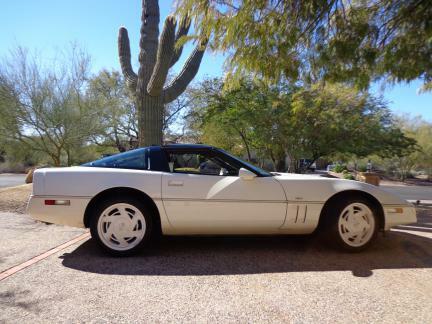 SHOWING 23,000 MILES ON THE ODOMETER, THIS EXTRAORDINARY EXAMPLE OF THE 35TH ANNIVERSARY CORVETTE PRESENTS IN THE SAME AS-NEW CONDITION AS WHEN IT ROLLED OUT OF THE ASSEMBLY PLANT. 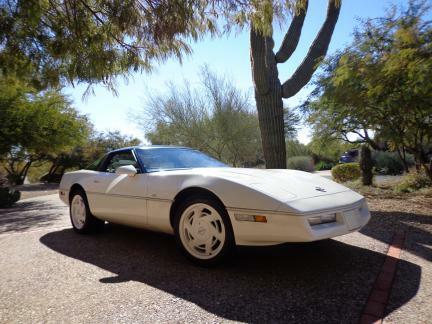 ONLY 9% OF ALL COVETTES MANUFACTURED IN 1988 RECEIVED THE Z01 35TH ANNIVERSARY PACKAGE WHICH COST AN ADDITIONAL $4,795 OVER THE BASE PRICE OF $29,480.00. 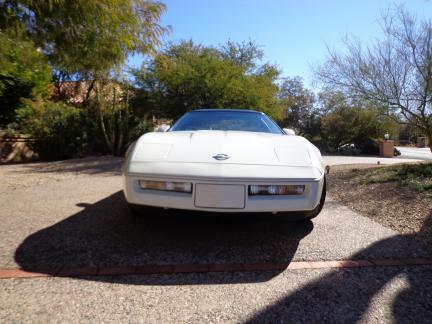 THIS CORVETTE (No. 1571) OF 2050 HAD AN ADDITIONAL $5,000.00 CHARGE FOR ADDITIONAL DEALER MAKE-UP, BRINGING THE WINDDOW STICKER TOTAL TO $39,750.00, “A PRICEY SUM FOR 1988”. 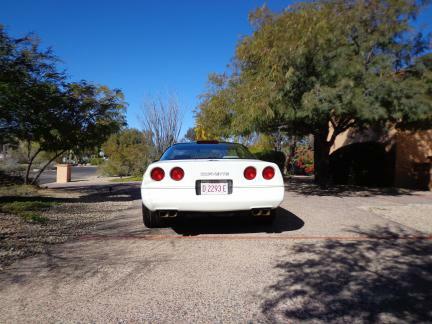 THIS LOW MILEAGE, (ONLY 23,000), HAS THE L98 350 C.I., 240 H.P. DEVELOPING 340 FT. LBS. OF TORQUE. THIS SHOW ROOM CONDITION VEHICLE HAS POWER STEERING, POWER ANTENNA, TILT-TELESCOPIC STEERING COLUMN, CRUISE CONTROL AND 4 SPEED TURBO-HYRAMATIC AUTOMATIC TRANSMISSION. THE BUILD SHEET AND ORIGINAL WINDOW STICKER IS WITH THE VEHICLE.